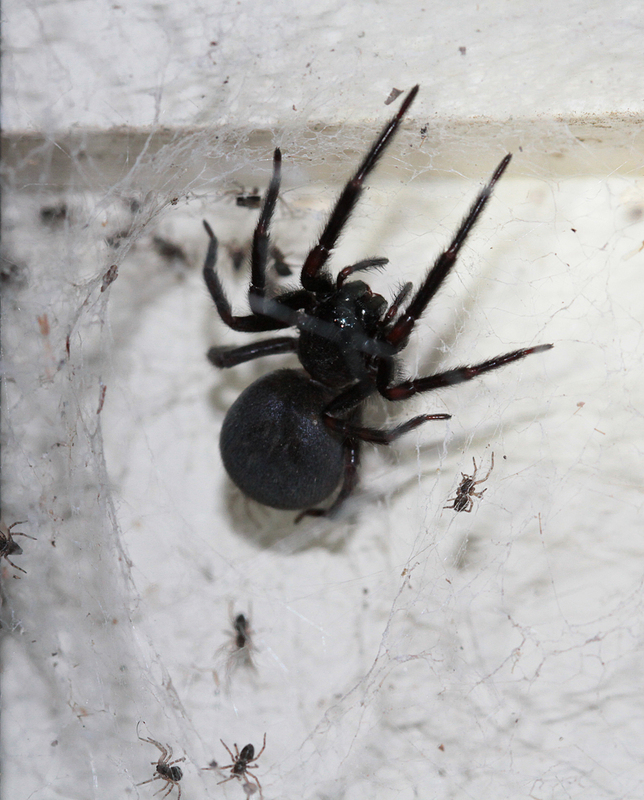 Unlike the orb weavers who make a stunning show in summer then disappear, my black house spiders are a constant presence. Please meet Lily, my favourite this year. She lives behind an outdoor art work of a lily hanging on the verandah, hence her name. Lily is a black house spider, Badumna insignis. When I first met her, Lily was quite large in the abdomen. (Spiders don't mind you mentioning this.) She was gravid, ready to lay her eggs. She appeared less often, but did come out for dinner one night. A few weeks later, and her babies emerged with her. They only hung around a few days and were gone. If you click on the photo below and look closely, you can see that her fangs work inwards like pincers. She is a 'modern' spider, an araneomorph. The so-called 'primitive' spiders like the trapdoors, Australian funnel-webs, tarantulas and mouse spiders, have their fangs pointing down so they raise their bodies to strike. They are known as mygalomorphs. You can also see her little claws which she uses to hold onto the web. Gorgeous creature! No more photos. Good night. Hello! I am new to your blog. I too really like spiders. This lovely black house spider reminds me of our U.S. species known as the parson spider (http://www.spiders.us/species/herpyllus-ecclesiasticus/#more_pictures), which is also pretty common in houses but it does not build a web. Thank you so much for commenting, Marcoli. The link to your Parson Spiders is really interesting. Thank you for providing it. I am just finishing the last stage of a new book coming out in July (not about spiders, unfortunately) and as soon as that is done I will get the time to blog more about my beloved spiders. I hope you will stay in touch! I had one in my bathroom, I called her Big Momma. My son and I watched her grow and a week ago she had 6 babies. I went to check on her today and and she was gone. Even her web was gone. She left 2 of her babies behind. What I want to ask you is could she clean up and move, cuz everyone says they didn't mess with her, and can her little babies survive without her? 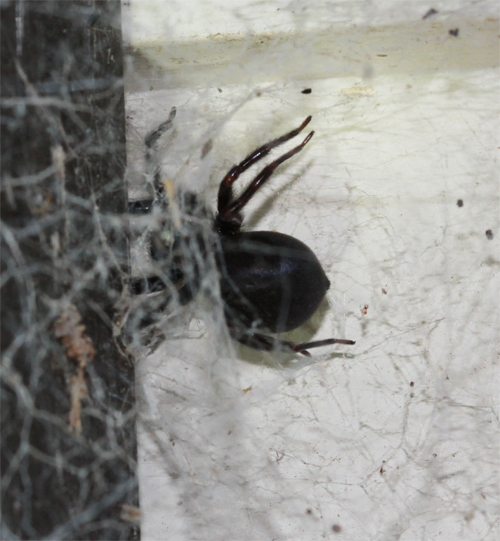 If it was a black house spider, I would very much doubt that she would have cleaned up the web herself. Orb weavers do that, but I have never seen black house doing so. However, other critters may have done - lizards and birds in particular - but I can't imagine birds in your bathroom. The winged enemy do collect webs for their nests. Spider silk is the perfect material - flexible, soft, will not rot ... and when the bird grabs the web they will often take the owner as well. As for the young, they don't need their mother to survive. Their chances are very slight anyway, but should they manage to be one of the 1% or less that make it to adulthood, they will have to do it on their own. Incredible critters. Please send updates if you have them! Lynne I have had a female (I think) living on my study wall for 8 months. Yes, you do gat to adore them. She/he just molted and since has not been able or wanted to maintain the web. No typical web spinning, using the back legs. No interest at all. I was convinced she was a she however I am researching what might be going on and have found some information describing males when reaching maturity, loose their cribellum and calamistrum. Do you know anything about the situation my spider may be in. I would be very keen to read the information on males losing their cribellum and calamistrum. I haven't come across that. Where did you read it? The males are significantly smaller than the females. Where are you? In Australia? I would love to know more about this spider. What do you mean by 'on my study wall'? They usually use crevices of some kind. She reminds me of our Kukulcani hibernalis, the Southern House Spider. I have a barn full of them. I've just looked them up. We don't have them here in Australia. It is a cribellate web spinner like our back house, but does orbital webs. Amazing. Same crevice building habit. A lot is very similar, so I suspect they inhabit a similar ecological niche. I'm jealous of a whole barn full of them! 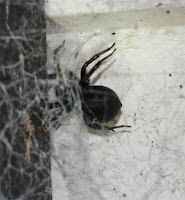 Thank you so much for commenting - I learnt a lot reading about Southern House Spiders. Fascinating! I was just wondering, are they harmful to humans? Should we worry if they're in the house? They are very shy, so the only way to get bitten is if they somehow get caught in clothing or bedding. They will not usually leave a web, so leaving a web is fine - the owner will stay put. That said, they do have a very nasty bite although I know no-one who has been bitten, I have heard of it. There is no long term damage, but it is temporarily painful. I have them in the house, but they then have to be moved out if they add an egg sac because I don't want lots of them inside. I think it is probably best not to have them in the house unless you are an obsessive spider-adorer like me. But leaving the web on the outside of a window will let you observe them and realise that big, black and ugly is actually big, black and gorgeous!